Stella Arnaldo's Blogspot: Jollibee invades New York! “This is the taste of my childhood,” said Emma Ilagan, a 36-year-old customer service representative for Verizon Wireless who left the Philippines when she was 21. “Until now, you have to go to California for Chickenjoy,” she added, referring to the chain’s popular dish of fried chicken, gravy and rice. I dunno about it being Pinoy "soul food", but Jollibee is truly a phenomenon. 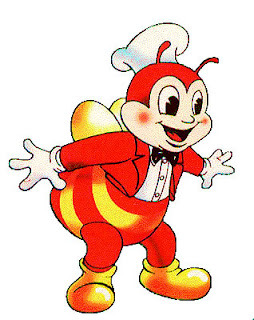 You have to hand it to Tony Tan Caktiong, beginning with just two ice cream parlors back in 1975, Jollibee now has 600 stores nationwide and 30 overseas. It also owns Deli-France, Greenwich Pizza, and Chowking. It is only here in the Philippines where McDonald's has been beaten by a homegrown burger company. And while I'm not a total fan of Jollibee's food, it still makes me proud that a purely Pinoy brand, has just landed in New York. What a great way to start the week, isn't it? Clap for them! we are very happy with jolibees arrival,like anyone else,the pinoys palate here in ny or maybe entire northeast cannot wait to grab that chicken joy or the yum burgers,what we didn't like is the line outside reaching 3-4 blocks.can the manager of jolibee think of a way in getting fast service?is the price higher than it's west competitors?i hope jolibee management can speed up service to prevent this never ending line. Anonymous 8:49 >>I'll forward your comment to Jollibee reps here. The managers there probably just didn't expect such an overwhelming reception. Well, that's a good news. I enjoyed reading your post. I'll be looking forward to some interesting topics here, so I'll be sure to keep on coming back here. Thanks for sharing and Good luck.